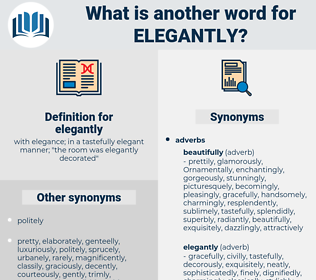 What is another word for elegantly? with elegance; in a tastefully elegant manner; " the room was elegantly decorated"
There he stood, between the kitchen and the scullery, elegantly attired, with an inquiring eye upon the kettle of warm water on the stove, debating whether he should make the decisive gesture of emptying the kettle into the large tin receptacle that lay on the slop - stone. A very elegantly furnished room, with light, pretty furniture.